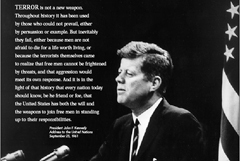 President John F. Kennedy challenged this country to land a man on the moon and return him safely home within one decade. This country mobilized like never before or since in the history of America and accomplished an amazing feat. Our energy crisis demands such action.